By Chris Rechtsteiner, Page Foundry, Inc. Some decisions are really easy. The decision to tweet, for instance is simple. It’s only 140 characters. The same is true with commenting on a website, writing a letter to the editor or crafting your own blog post. These content creation decisions can be easily weighed and acted upon (without repercussion) any time, day or night. This is why you see such a proliferation of new, short-form, digital content. Publishers must deliver digital content that provides immediate gratification and, most importantly, lasting value to the reader. The problem today is that the acquisition of digital content is seen as temporary. It is something a reader purchases and consumes and then either deletes, archives or forgets. Digital content (books, newspapers, magazines) must become bites of information for the reader to access handily as part of the day-to-day. The content must be willing and able to be tossed into conversation or shared at a moments notice. Digital content must become an integral part of the reader’s pool of reference and referral resources. 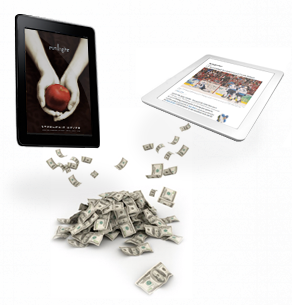 As a publisher, do you make your readers aware of this value in your offerings? Do you even offer this value? I’m willing to bet this is overlooked as publishers seek to deliver more and more content without truly stopping to engage the reader in a new, more meaningful way. And digital content need not merely be given away for free or on the cheap. The impetus is now squarely on authors and publishers to create, in the words of Michael Bloomberg, “content people want to pay for.” If readers are willing to pay for it, by simple definition, the value has been recognized. Content must become recognized as an asset by the reader before, during and after acquisition and consumption. The reader may choose to do nothing more with this asset than put it on their digital shelf, but it must still be an asset that is always recognized and available, regardless of where the reader is located. As this transition occurs, the monies delivered for the content asset will increase. When periodical (news and magazine) digital content is in play, publishers need to demand that their advertisers deliver the best possible content and value to the reader to garner engagement. This means that advertisers must focus on providing content, not ads. Ads are largely ineffective and are already well down the slippery slope of irrelevance. Advertisers and publishers need to work together to provide quality content that delivers sustainable value to the reader, not a quick-hit brand impression. For example, an auto manufacturer may offer a mileage or fuel efficiency management application as “content” vs. yet another “ad” presenting a picture of the car. Think about the residual brand value (loyalty, if you will) that something of this nature can create. It’s exponentially more valuable and more social than any currently offered alternative. Publishers can’t let advertisers simply re-purpose content or half-hearted attempts to create new brand experiences. This happened on the Web and it has resulted in rapidly declining response and effectiveness. This decline undermines the economics of the advertisers and the publishers in one fell swoop. It’s that simple. This is a critical success factor for periodical content that can’t be underestimated in any capacity. Ads must be content, content that delivers sustainable value for the brand, the publisher and the reader. As this transition occurs, “ad rates” increase, allowing the price of content to fall and brand loyalty and effectiveness to increase. Device manufacturers must provide the connected, “always on” devices that meet the readers needs today and tomorrow. They must do this without requiring the purchase of monthly wireless and 3G data contracts. That model has been tried, multiple times, and it simply doesn’t work. The publishers must enable them with robust catalogs of content — whether they are developing a single purpose reading device optimized for books or multifunction tablets optimized for rich and dynamic content. These devices must provide frictionless, ubiquitous connectivity that enables the reader to find, buy and read content anytime, any place. It is only when all of these pieces come together (content, commerce, connectivity) that the device delivers the value expected by the reader. The devices must be “always on”. The reader must have a choice from a wide selection of device price points (and capabilities) to meet their needs. So, since the signposts are clear as to what we need to do, what’s stopping us on our journey down the road to sustainable value? The lack of a collaborative digital and publishing ecosystem. The main obstacle is that each member is working in a “save yourself” environment. The perception is that there will be one e-book, one e-reader, one platform to rule them all, and this couldn’t be further from the truth. The digital ecosystem is such that it requires –- like any ecosystem -– all the parts to work in tandem. Part of the problem is that traditional publishers and content creators, despite years of working on a viable digital content strategy, are still dealing with a list of unknowns. As a consequence, they feel as if their business model is threatened. “Why is going digital so hard?” is a question that is asked more frequently than ever before. The simple answer is the technology and economics involved are deeply entrenched and not immediately replicated by a quick transition to digital. The complete answer also includes the significant fact that a successful digital content strategy isn’t one thing. A successful digital content strategy is supported by an extremely complex ecosystem that has to be properly navigated in order deliver success. Success is measured in the delivery of sustainable value to mass market reading consumers (readers for short) as well as each member of the ecosystem. If you are a book, newspaper or magazine publisher, however, the decision to begin moving your content, and by extension your business, from print to digital isn’t quite so easy. Stop and think about this for just a few seconds. Products and services from global organizations including publishers, device manufacturers (those making smartphones, tablets, etc. ), content management companies, content aggregators, metadata providers, payment processors, retailers, e-retailers and wireless network operators (to name a few) must be fully in sync to provide the complete and tightly integrated solutions readers expect (today) and will soon demand (later today or, at best, tomorrow). All of these players must participate profitably in order to provide compelling digital content solutions to the mass market. When looking at what really lies behind a digital content strategy, it’s not difficult to see that this transition an amount far greater than the $130 billion spent each year on books, newspapers and magazines at stake. By now you are likely asking yourself, how do I, as a member of this ecosystem, make digital work? This answer, fortunately, is really quite simple. Deliver sustainable value. Each month tens or hundreds of thousands of readers are entering the digital category. They are aggressively purchasing more e-reading devices and digital content every hour of every day. They are voting, with their wallets and their mindshare, that digital is the present and the future for them. If the reader who is entering this category today is to stick, however, they are going to have to immediately realize a sustainable value from their investment. If they have a poor experience (content, device or connectivity) they are “one and done.” Even worse, they are extremely unlikely to return to the category, the service provider’s or the device manufacturer’s brands any time soon based upon a poor experience. Readers’ needs and expectations can’t be met and the market opportunity can’t be realized without collaboration. Yet, despite this massive growth, the digital content sector remains largely untapped. Why is this? Again, the answer is simple. The mass market reader (this is an important distinction, the mass market reader, not the early adopter or the tech enthusiast) has yet to vote with their dollars. The price of entry is too high and the sustainable value is too low, if it’s recognized at all. This places the responsibility of delivering sustainable value on the entire ecosystem in order to grow the total available market. On the surface this sounds slightly socialist, but that is not the case. The ecosystem must recognize that it is, in fact, dependent upon one another for the overall success of this market…just as television and broadcasters were once dependent upon each other for their success of a brand new mass market offering. By working for the reader as opposed to against each other, members of the digital content ecosystem can provide solutions that are mass market targeted and allow everyone to participate in this next wave of profitable growth. Increased value in digital content. Increased ad revenues delivering stronger brand loyalty / effectiveness. Readily available and affordable devices on which to consume this new content. Isn’t this exactly what everyone wants? Chris Rechtsteiner is a co-founder and chief marketing officer for Page Foundry, Inc, a digital content enablement platform helps publishers and device manufacturers deliver “always on” digital content solutions. When Chris isn’t thinking about digital publishing and value-based customer engagement, he can be found snowboarding with his two sons. DISCUSS: What are Digital Publishing’s “Durable Goods”? VISIT: The Page Foundry website.